Valve markers use proven technology which has been in use for over 50 years. 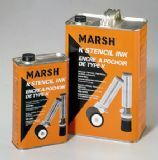 When the tip is pressed down, it operates a spring loaded plunger which opens the valve, letting the ink flow through to the tip which allows the user to regulate the quantity of ink dispensed. If the cap is left off, the tip can be re-primed, so you can use all the ink inside the marker. Marsh markers last longer than other disposable markers because they contain more ink. And no ink is wasted in our valve operated markers as it flows uninterrupted through a hollow chamber. So Marsh markers stay wet for thousands of uses.